I drove up and had a nice day walking around the town! I was thinking along the lines that the amount of tape you would need would actually cost you nearer Ã‚Â£25. This would then cover a similar area as the invisi kit, which has to be about 70/75%..
One of my bikes is 'copter taped (the sort Breezer recommends) the parts that are taped are in good condition with no damage showing despite the frame being second hand and having a hard life on the bike rack most weekends. One area that was not taped was the seatstays and my heels have rubbed a good proportion of paint away. I have feet like Donald Duck. EDIT - I've not had an unexpected rub in a long time. Good find - cheers. Has always used the old tube trick but it's a bit of a faff. 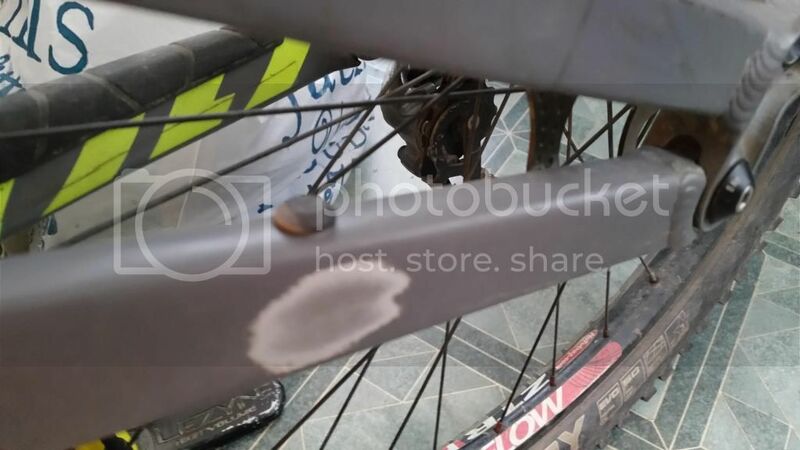 Hmm, that self amalgamating tape looks like a good idea, I've innertubed the seat and chainstays on both sides of my Pitch to avoid the heel rub marks that I tend to put on my bikes. I blame the clumpy 5.10 shoes. Actually, the DS chainstay has a nicely formed Specialized rubbery covering, but there's nothing wrong with dressing your bike like a cut-price gimp. I've used cable ties to hold the tubes in position, it doesn't look bad. Well, seems I have Daisy Duck feet in my 5/10s..... gonna wrap it up with some of that nice tape! I have always used this stuff as its thicker and goes on better than the Stuff Breezer linked to. I did the bike I have now with some E-Bay stuff and it's held up well although I like the look of a well formed kit. Have used the Amalgamating Tape on chainstays before and yes it's very effective and easily replaced. Incase anyone's interested Lee at Invisiframe said he'd fit it for 20 quid but it's too far away in Shewsbury. Gutted, just checked the Invisiframe site and they don't have a kit for my Boardman roadie or my Trek hardtail! What kinda monkey operation are they running there?